Purchasing the right cat door is essential for any cat owner. In that way, your cat will not feel as if he’s trapped inside the house. They can come and go as they please. It also reduces the chances of your cats scratching the backdoor in an attempt to go out. If you let your cats play outside, having a cat door is handy because they can quickly get inside in case severe weather is coming in. A quality cat door may also save your cats from any predatory threat outside the house. If this is your first time to buy, check out the top 10 best cat doors for every cat owner. 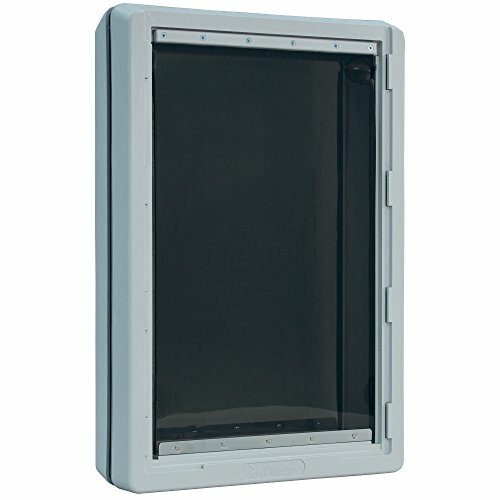 If you are looking for a sleek-looking yet affordable cat door, check out this product. The no-nonsense installation will only take a few minutes of your time, and it’s ready to use. Its high-quality aluminum finish will fit any sash window in your house. It also features a magnetic flap closure to ensure that the door is sealed when your cat is not using it. The solid construction of this product is an indication it can last for a long time with proper maintenance and use. Meanwhile, a spring-loaded locking slide keeps your house secured at all times. This product from High Tech will suit any tech-savvy pet parents with its motor-driven vertically sliding door. The MS-4 high collar activates the system. So, whenever your pet is approaching the door, it will automatically open for them. For easy access, it features 4-way access so that your cat may come and go as it pleases. It’s also windproof and weatherproof. Meanwhile, the automatic deadbolt locking adds another level of security to ensure that the door is locked the moment your cat got in or out of the house. The generous size of the unit can fit pets up to 100 pounds. If your cat is scratching your door, pleading to go outside, this solves your dilemma. This large cat door can fit any doorway and is easy to install. It can fit medium to large-sized cats. You can lock the top and bottom of the door for an added level of security. Its unique design allows you to move from one area to another. 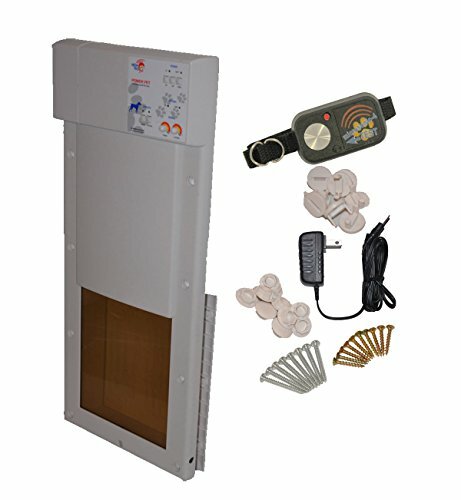 The side panels of this pet door keep stability and ensure that your pets will not knock this over. It can expand to overall width to cover your hallway or front door. This durable and energy-efficient all-weather pet door with an inner telescoping frame is perfect for your cat that loves to play outside. It features a structural foam molded plastic frame with two vinyl flaps to provide maximum insulation. The generous size of the pet door can fit cats up to 120 pounds. You can install the cat door within a few minutes. For added security, you can purchase their optional wall kit (sold separately). Upon installation, you need not worry about opening the door five times a day just to let your cat outside. When installing a cat door, you face another problem of wild or stray cats entering your house. Fortunately for you, you need not worry about it anymore because the microchip keeps only your indoor pets inside the house. The dual antenna works by detecting if it’s your cat trying to access the door. It also features a safety learn mode for indoor cats. In that way, they can still get back inside when they escape using an open window. Any microchip is compatible with this product. The unit requires four AA batteries that can serve you for a year with regular use. 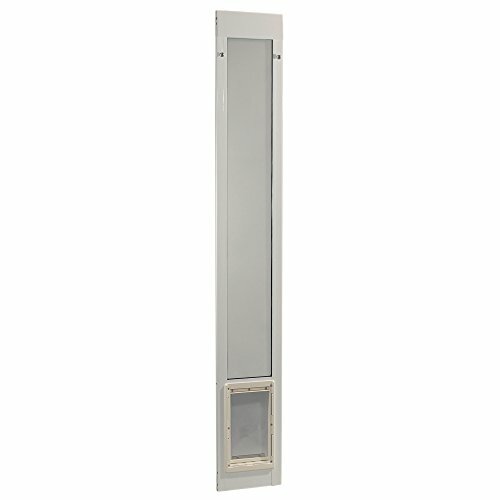 If you are looking for a cat door that could fit your aluminum sliding patio doors, check out this product. This is a perfect choice if you are renting a house or apartment and aren’t allowed to make significant home improvements. You can install the cat door in just a few minutes with no tool required. This flexible transparent vinyl flap allows your cat to slip in and outside whenever he pleases. 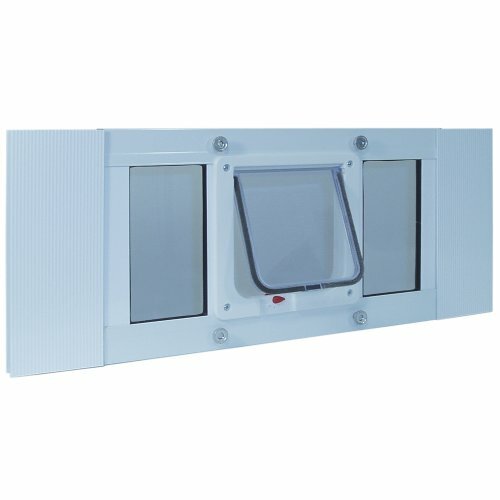 The white patio panel frame is clear tempered safety glass. In that way, your cats are confident to play outside without getting locked out during the night. This unit uses advanced technology and includes two electronic ID discs in keeping wild animals out of the property. It uses four AA batteries that can last for a year with regular use. The LCD shows you the selected entry and exit lock status. It also provides information about your cat’s location. 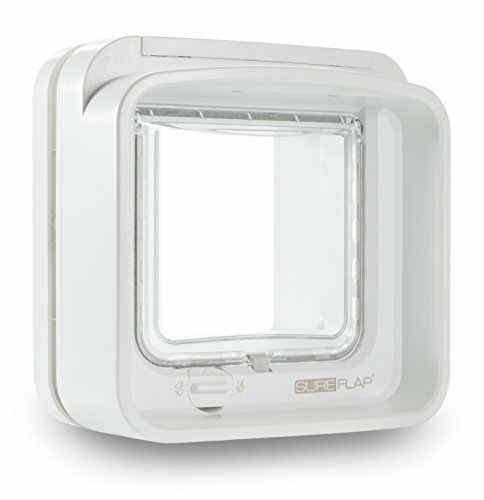 The time flap can be used for up to three medium-sized cats. 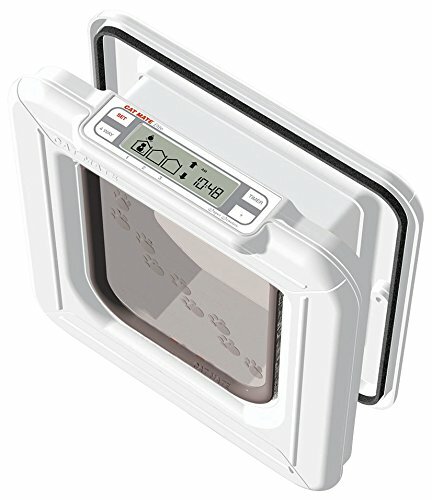 Its timer function control helps in keeping your cat safe inside the house at night should they decide to play outside. Self-lining up to two inches, it’s easy to use and install. The frame rain seal and entirely draft weatherproof brush sealed flap is built to last a long time. Only your pets with RFID collar tag may access your house. 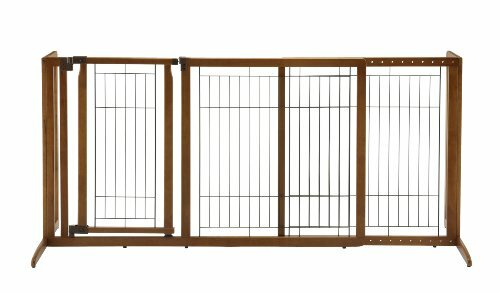 This universal freestanding pet gate is a great option if you want to separate your young kids and pets inside the house. It keeps your pet in one place while keeping the elegant vibe of the area. Made of solid-wood and triple hinge construction, this gate can last for a long time with proper care and maintenance. Its durability can withstand even large cats that will try to knock it over. The double-jointed hinges allow you to configure the gate in C-shape or Z-shape. You need not assemble this unit. It is ready to use right outside the box. The cherry stain wood will look great in any modern living rooms. This durable cat door is just what you need. 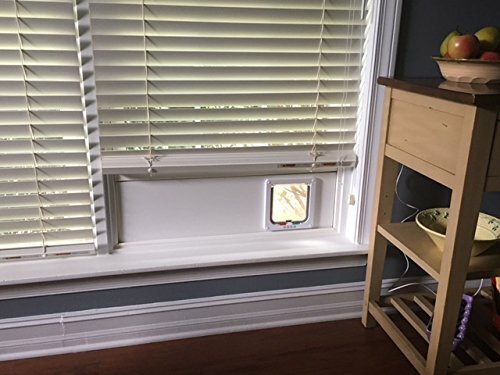 For active cats who love to play outside the house, you can install this cat door. It’s mold resistant, PVC-based and moisture proof to last for a long time. You need not cut through your window or door. Installation time is only a few minutes, and it’s ready to use. The product is the perfect choice especially for renters moving from one place to another. It’s easy to remove as much as it’s easy to install. No tools are required upon doing so. This practical choice of a cat door solves your feline friends who spend the day outside and keeps on getting locked out during the night. With this product, you need not replace the flaps now and then. Its durable dual-hinge flaps are made of K9 composite. 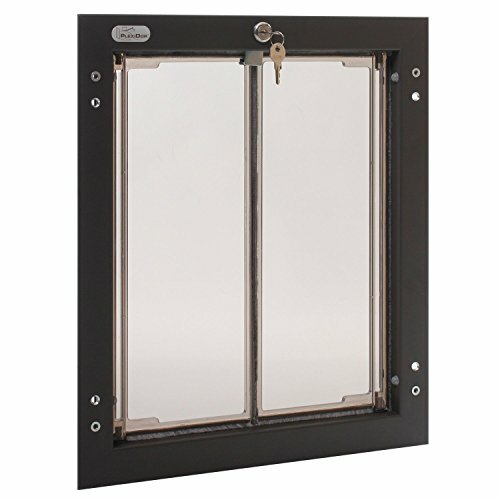 As long as it’s installed in your door, you will not worry about replacement in the long run. It includes a lock and key steel security plate to ensure the safety of the house’s occupants. It’s also energy-efficient. The tight-sealing saloon-styled doors made of lightly tinted aircraft-grade plexiglass will maintain the temperature inside of your house. The generous size of the model can fit cats up to 100 pounds. It may be surprising to know all the uses you could put a dog door to, even if you don’t have dogs. If you have a pet cat, the dog door can also be used by that. 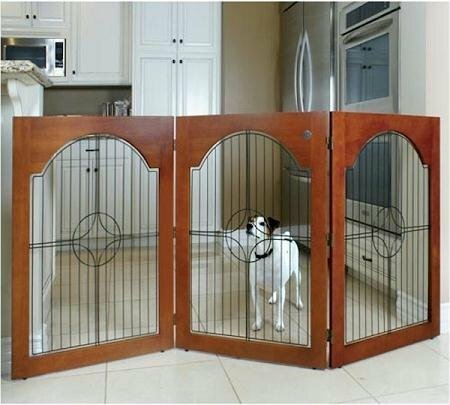 This is also convenient if you have a small dog or a pup – so the same sized door can be used by both. Usually owners install dog doors for dogs but rarely bother to do the same for cats.